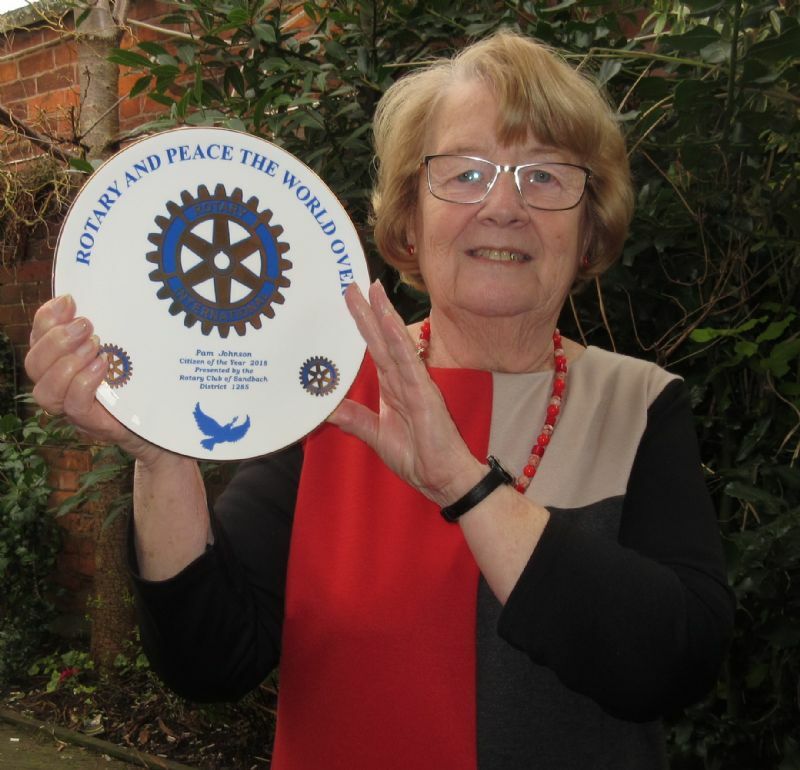 The Rotary Club of Sandbach's "Citizen of the Year" award has been made to Pam Johnson for service to the Sandbach and District Talking Newspaper. Each week the Talking Newspaper, with items of local news and views, is distributed free to members of the community who are visually impaired or have an incapacity which makes reading difficult. The citation for the award was made on behalf of the Club by Graham Allcock, chairman of the Newspaper. He said that Pam is the Talking Newspaper! Following the loss of sight by her father and his love for the Congleton Talking Newspaper, she and husband Keith and some members of the Lions Club helped to found the Sandbach Newspaper. Since then she had been at the helm and has seen the Newspaper move from "a cupboard" to the present state-of the-art recording studio at Wheelock. Graham said that Pam had been at the centre of many changes including the switch from cassette tapes, with all their problems for recipients, to the present memory sticks. As secretary of the Newspaper she has many roles including keeping in touch with listeners to sort out any problems; drawing up rotas for readers; ensuring efficient delivery of the memory sticks and also acts one of the four editors. Graham concluded by saying that he was honoured to be involved in the presentation of the prestigious award to someone who has given, and continues to give, service to the community. After being presented with the specially made commemorative plate by President Richard Hovey, Pam said that she was "astounded" to hear that she had been voted to receive the award and felt very honoured. She said that her work for the Newspaper continues to give her much pleasure and the award was much appreciated.